More luminous, smooth and nourished skin. A cream with rich and velvety texture, a great ally. Nutrition and comfort for normal to dry skin. Tensor cream is an unique combination of SCA Biorepair and Tensoderm technology to the eternal struggle against firmness loss and skin relaxation. Formulated with 6% SCA, the natural activator of the skin regeneration with repair and antioxidant properties, and which acts effectively reducing signs of aging and photoaging, and Tensderm an active ingredient with powerful tightening effect which improves firmness and preserves skins elasticity by reducing the visible signs of aging such as sagging and facial contours loss. Return of the elasticity and firmness of the face, more defined and younger skin! Apply in the morning and/or evening on your face and neck perfectly clean. 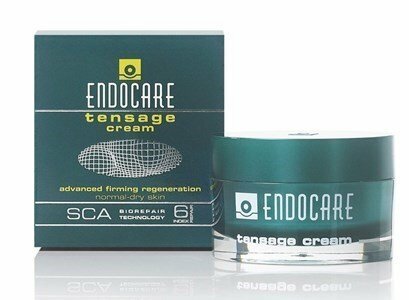 Tensage line from Endocare is indicated for mature skin. Light nursing, rich and velvety texture, with powerful tensor effect. Improves firmness and preserves skin elasticity, reducing visible signs of aging. A line of products to combat skin photoaging and dedicated to facial rejuvenation! You know the do you know the correct order to apply your beauty products? Does it really matter when and in what order you apply your skin care products? The answer ir yes. Applying your skin care products in the proper order ensures that your skin receives the full benefits of each product.